9) Excellent barrier against a wide range of gases. The products should be stored in a dry, well ventilated warehouse. To avoid direct sunlight and should not be stored in the open air. Be away from fire and heat sources. Should not be stored or transported together with chemicals and inflammables. The warehouse must be equipped with extinguishers or fire-fighting device. Chang zhou Yihe Composite materials Co.,Ltd is a service-oriented enterprises. We can give you professional services in the electronics industry and engineering industry. Our company is specialized in decelop, produce,sale the color polyester film and give technical support as customers need.Our products have Insulated film,Coating film ,Solar battery back basement membrane,Haze film. 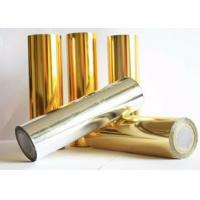 We also decelop and produce film for cable insulation,SMC bearing,food packaging ,etc. Our company abundant technology strength,and strong independent research and development strength. Packing: Rolls vertically packed on pallets, each roll packed in one PE bag, bubble film wrapping around each roll, paper plates on both ends of each roll, PE film wrapping around products and the pallet. Diameter of internal paper core of rolls:3 inches or 6 inches.